To take classes at any CUNY college, you need to take the CUNY placement tests in math, reading and writing. Maybe you breezed through all three. But if you failed one - or even all three - of the placement tests, you're not alone. More than half of New York City high school students in the Class of 2017 needed additional help after high school to pass all of the tests. But if you did fail a placement test, the first thing to remember is that your test score does not define you. If you feel down about your score, click here to learn about and experience strength-based thinking. Once you pay attention to your own strengths and feel confident again, it's time to direct your attention back to those placement tests. Fortunately, you have some very good options. First, if you came close to passing, you can try taking the math or reading test again. If you do re-test, don't forget to study using the materials here. 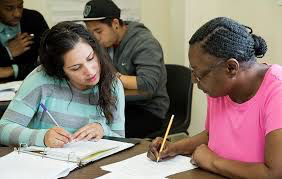 Most CUNY Start classes teach both math and reading or writing, but if you just need one subject, you can sign up for part-time reading/writing, part-time math, or Math Start at many campuses. You can find out how to apply to CUNY Start or Math Start here. If you are an English language learner who needs more instruction in English, you can take CLIP (the CUNY Language Immersion Experience). Like CUNY Start, CLIP is a low-cost, intensive class that will help build up your skills as well as prepare you for the placement exams. CUNY Start, Math Start, and CLIP not only prepare you for the placement exams, but also get you ready for college. If you just need a little brush-up, though, you can take a traditional remedial class or you may be able to take an immersion class. Immersion classes are 2-week intensive review classes that move at a very fast pace and allow you to re-test after just two weeks. Most CUNY community colleges offer immersion for free, but only at select times of year.